A relatively easy paddle with plenty of attractions. The urban industrial landscape—pilings, piers, towering tankers—around Islais Creek offers a unique departure from many back-to-nature paddling excursions in the Bay Area. Named for the Native American word for holly leaf cherry, which used to grow in the area and was a food source for Native Americans, the creek is a great spot to launch a paddle north along the shore to AT&T Park or south to Bayview and Hunters Point. It also offers a fascinating look into a slice of San Francisco history, as the creek is part of the largest watershed in the city and was once the site of thriving slaughterhouse and canning industries. 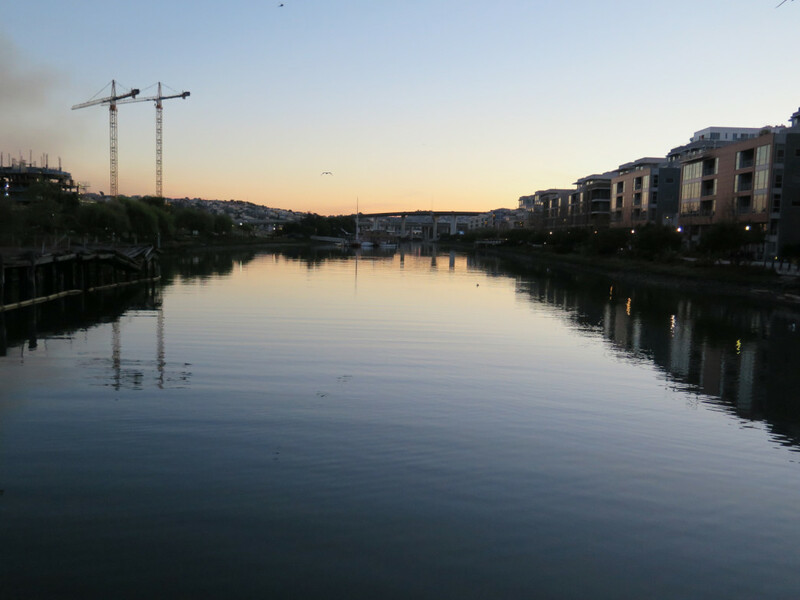 Its gritty urban industrial landscape and serene waters make Islais Creek a interesting departure from many coastal spots in San Francisco. It’s also a great place to start a paddle if the winds are westerlies and too strong to paddle from places like Crissy Field, for example. Enjoy exploring the shoreline full of dry docks, piers, and boats—depending on the tide, you can sometimes carefully venture under docks and piers. In addition, an extensive renovation and cleanup effort by several neighborhood and activist groups in recent years has made the put-in area and creek itself a much more appealing. In fact, it’s hard to believe that, in the 1950s, the waterway was known as the creek you proverbially be up without a paddle, thanks to decades of neglect. Circa 1870, following an influx of slaughterhouses that moved into the area, the creek was used for dumping the vile remains of that bloody business. The creek was later used as an open sewer until a water treatment plant was built around 1970. In the mid-1980s, an environmental activist group called Friends of Islais Creek helped spark a massive cleanup effort still underway today. 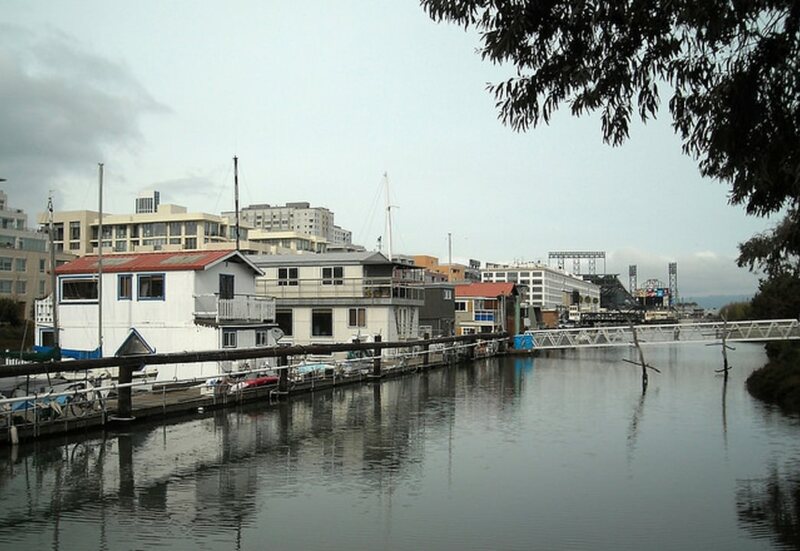 City lovers and those looking for an easy urban paddle will find the convenience of Islais Creek and its nearby put-in ideal. In addition, paddling enthusiasts who live in the South Bay will find it a more convenient spot to put in for an urban excursion than driving all the way to Crissy Field. And because it’s such a hidden spot, you’re not likely to see any tourists on the water. Round off our day on the water with a burger and beer at The Ramp, a quirky spot that’s right on the water close to the put-in. From the 101 or 280, exit Cesar Chavez and head east until you get to Third Street. At 3rd, turn right and head south, keeping an eye out for the steel bridge that spans Islais Creek where the put-in is located. Portage is about 50 feet. The city-built floating dock is where you’ll launch, but keep an eye out for the 180-degee turn, which can be tricky with a kayak. Parking is free, although it can be a little hard to find on weekends (as it goes for just about anywhere in SF, be sure to lock your vehicle and keep valuables out of sight). No facilities are available. Local history is displayed on a notice board in this little area, which has been renovated in recent years.